TORONTO, ONTARIO--(Marketwire - Oct. 8, 2010) - Preliminary data released today by CMHC show there were 182 single-detached starts in the Hamilton Census Metropolitan Area (CMA) in September, the majority of which were in the City of Hamilton. Single-detached home starts have been rising in recent months in the City of Hamilton. 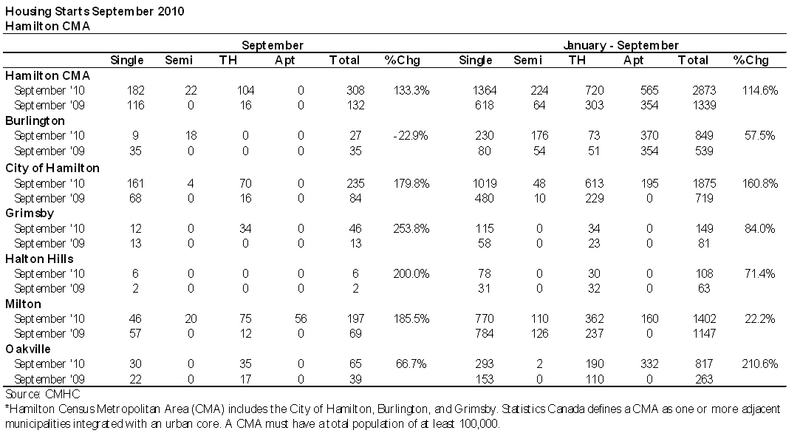 Townhouse starts in the City of Hamilton and Grimsby also contributed to the rise in starts last month in these cities. In Burlington, fewer starts of single-detached homes led to a fall in total starts. Starts in the first three quarters of 2010 were higher than they had been in the same period a year earlier. The revival in new home starts was due to an increase of in all three municipalities of the CMA, and for all home types from single-detached to apartments (both rental and condo). "Builders were busy last month with new home starts more than double from a year ago," said Sarah Fong, CMHC's Senior Market Analyst for Hamilton. "A higher proportion of the starts occurred in the City of Hamilton, where starts of both single-detached homes and townhouses were up substantially." added Fong. For housing forecasts that will inform your business strategy in 2011, attend your local housing market outlook session this November. Visit www.cmhc.ca/conferenceregistration for complete details.